Take a group of well seasoned motorsports enthusiasts, get 'em all working together in a small town on the eastern reaches of Puget Sound, and you've got a dealership that's ready to serve a large customer base across a number of brands and riding styles. Photo: Before the annual R.A.T. Pack Ride. That's long time I-90 Sales Manager, Don Shields, 4th from right. Kurt Opel, the general manager of I-90 Motorsports, provides a first-hand view into the difficulties and rewards of running a motorcycle dealership. In this economy, when recreational pursuits such as motorcycling are pushed to the wayside, it can be especially difficult. Opel admits that the recent economic times have been threatening but not insurmountable. Many small businesses and dealerships are suffering in these brutal economic conditions, so how do some dealerships survive, or even thrive? I-90 Motorsports has found the way. Located in Issaquah, I-90 is a mid-sized dealership selling new and used units, parts and apparel, and providing service by a staff of seasoned techs. Although primarily dealing in motorcycles, jet-skis and snowmobiles also play a role in the dealership's sales success, and accommodate customer's varied tastes all year long. "Primarily during the spring and summer, we sell a great deal of street bikes and boats; in the fall we move a lot of ATVS, and in the winter we sell a lot of snowmobiles,” says Opel. Fall and winter months are also when I-90 takes on special custom jobs for the occasional enthusiast or collector. Their most recent assignment: restoring a classic Triumph Bonneville into an immaculate cafe racer, complete with narrow gas tank and spoke wheels. I-90's service department can handle up to six motorcycles at once. Opel, who has been racing and riding motorcycles since he was eight years old, has his background in the restaurant industry, and according to him ”.... managing a motorcycle dealership is like running three or four businesses at once. Each aspect of the business contributes to the bottom line; sales, retail, and service.” This is one reason that I-90 Motorsports stays strong. 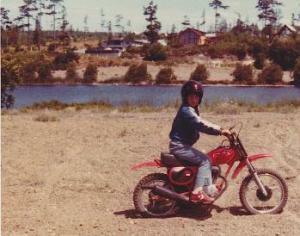 Photo: Kurt Opel as a kid on his XR80. Inside, there's an expansive sales floor with an impressive showing from Honda, Yamaha and KTM, and an entire section reserved for Triumph. I-90 is one of the largest sellers of Triumph motorcycles in the United States. By next summer, the showroom square footage will more than double with an add-on that is currently in construction. The harsh economic conditions have also taught I-90 to be more aggressive with resource distribution and to capitalize on market trends. With the recent closure of several other local shops, I-90, like others still around today, have parlayed their location and ability to get the job done into additional business for those customers who were without a local shop. With two dealerships under the same ownership, I-90 has learned how to capitalize on and better manage their parts inventory. With their sister location, Ride Motorsports, just to the north in Woodinville, I-90 can now turn a parts order for items not in stock in as short as a day. If I-90 doesn't have an item in stock and Ride does they can source and have it in the store in 24 hours (vice versa for Ride as well). Community outreach is everything. 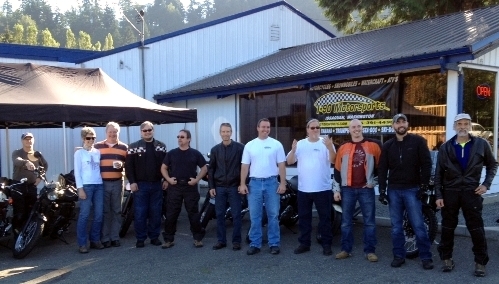 I-90 Motorsports hosts and contributes to a series of local and charity events around Issaquah. These events include Life Enrichment Options, a charity event to aid the developmentally disabled. The dealership also participates in Bikes, Burgers, and Babes, a local event that features riding displays and contests, bike judging, burger eating contests, prizes, vendor booths, motorcycle dealerships and more. In-house events include educational seminars that teach everything from avalanche safety when snowmobiling to how to change a motorcycle tire.